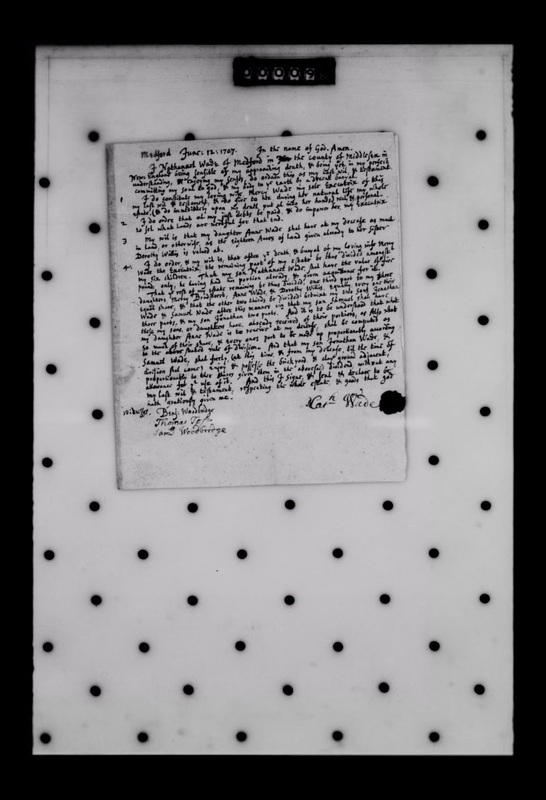 Genea-Musings: Amanuensis Monday - Will of Nathaniel Wade (1648-1707) of Medford, Mass. Amanuensis Monday - Will of Nathaniel Wade (1648-1707) of Medford, Mass. Medford June: 12: 1707 In the name of god, Amen. committing my soul to god, & my body to y^e earth by a decent burial. estate (& do immediately upon my death put it into her hands) real & personal. to sel what lands are needful for that end. Dorothy Willis is valued at. pounds only, he having had his portion already, & given acquittance for it. Middlesex County, Massachusetts, Probate case files, Nathaniel Wade Case File 23,417, 1707, Medford, 15 images; "Middlesex County, Mass. Probate File Papers, 1648-1871," digital images, American Ancestors (http://www.americanancestors.org: accessed 3 August 2017); original papers on file at Suffolk County Probate Court, Boston, Mass. Nathaniel Wade (1648-1707) died 28 November 1707. He married Mercy Bradstreet (1647-1715) in 1672 in Andover, Massachusetts. They had six children living at the time Nathaniel Wade wrote his will on 12 June 1707. All six children are named as heirs in the will. There are no records of a probate by the executor, Mercy (Bradstreet) Wade, who died in 1715. Son Samuel Wade was appointed administrator in 1714, the will was proved on 3 November 1714, but the estate was not settled until 1724. By that time, son Jonathan Wade was deceased. The probate case file has a number of receipts for debts owed by Nathaniel Wade, several accounts filed by Samuel Wade, but no inventory. The accounts are very difficult to read. Nathaniel Wade (1648-1707) is my 8th great-grandfather. I descend through his son Jonathan Wade (1683-1720), who married Mary Dolberry in about 1701.